I had initially researched this topic a few months back and decided not to write about it since it did not yield the results I was expecting. Some recent twitter conversations with Carter Shanklin and Didier Pironet this morning motivated me to dig up this content and share it with the community. !!!! THIS IS NOT SUPPORTED BY VMWARE - PLEASE USE AT YOUR OWN RISK !!!! As you all know, ESXi does not have a Service Console like the classic ESX, but it does have a limited console based on Busybox, specifically v1.9.1 which is still the current version even with the latest release vSphere 4.1 Update 1. Busybox is heavlily customized by VMware and you will find a limited set of POSIX-like utilities, it is no where feature complete to your traditional POSIX environment and there is good reason for this. If you have ever downloaded vSphere Hypervisor (formally known as ESXi), you may have noticed an "Open Source" tab at the top. This page contains some of the open source licensing information that VMware has used and incorporated into their products, most of these are just text files listing the various packages. One file that is of interest is the "OSS Source Code for ESX, ESXi and ESXi Embedded 4" which actually includes some of the open source RPMs and packages used to build Busybox for both classic ESX and ESXi (Yes, classic ESX also includes a busybox binary). The build environment that I used is running the latest version of CentOS 5.5 64bit which can be downloaded here. Note: Don't worry about the warnings regarding the user/groups that do not exists, these are most likely a default from VMware's environment that expects the mts user and group. Now if you executed the above, you will find that you quickly run into some build errors. This is where the "kind of" part of the blog post comes in. 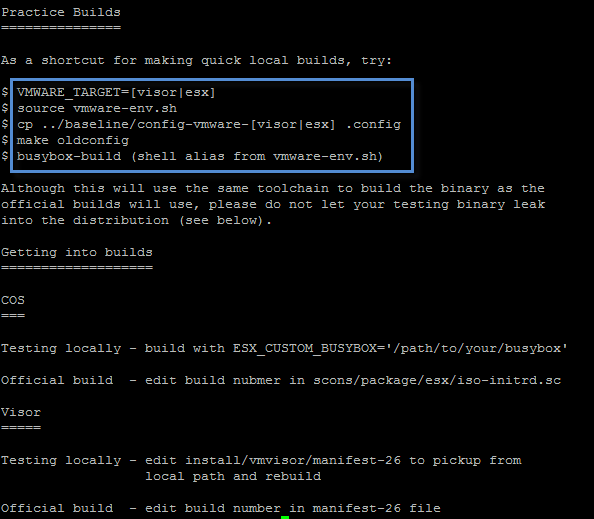 If you recall, we sourced the vmware-env.sh script just prior to building, this is a script that VMware wrote to quickly setup the build environment for compiling Busybox for either ESX or ESXi. For this particular build and release, they are using specific versions of GCC, Binutils and PAM. You might ask why not substitute these with the versions found on system? I have actually gone through that, but ran into other compliation issues which maybe due to fact that GCC and other components are much newer and not compatible with older versions of Busybox. 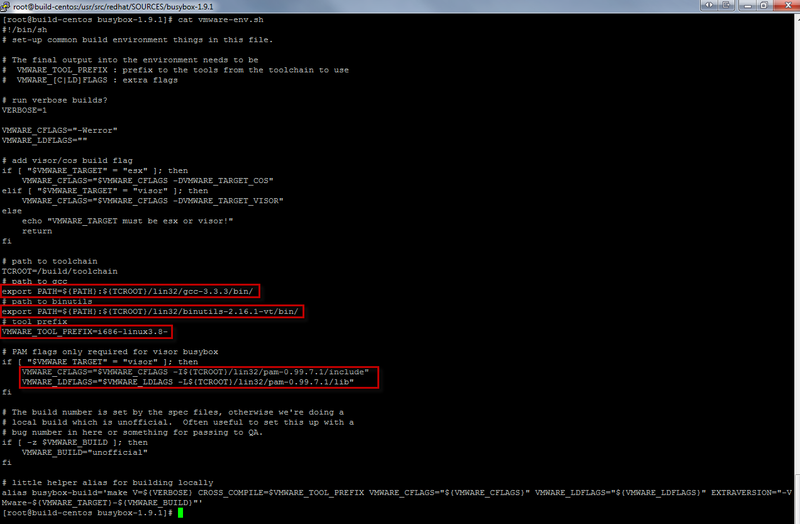 I have also tried to match the build environment by using buildroot but continue to hit other compilation issues. 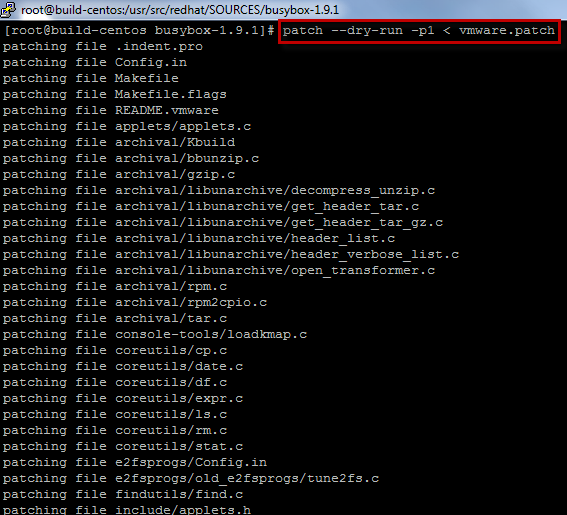 The only way I can see building this particular patched version of Busybox is to get a build environment that matches what VMware uses. Update: It looks like there is a slightly more recent version of ESX(i) OSS released on 07/13/2010, for whatever reason, it was filed under VMware View section. The source RPM for ESXi still looks like the same one released back in 2009, but there some other packages that differ from the one found on vSphere Hypervisor page. This is a great article!! I wish busybox included a better help function to allow users to search for commands. For example the man –k command can be extremely helpful.